Have you ever wondered whether your air conditioner is helping or harming your allergies to pollen, dust mites or mould? The indoor air quality of your home plays a significant role in your health, particularly if you are sensitive to allergies. This article explores the link between air conditioning and allergies and provides helpful advice to ensure your air conditioner is contributing to healthy indoor air quality in your home. Does Air Conditioning Help Allergies? Air conditioning can actually help with your allergies through air filtering, temperature and humidity control — if your air conditioner is regularly serviced and well-cared for. Your air conditioner’s intake filter removes a lot of common allergy triggers, such as dust and pollen, as it filters your indoor air. Having an air conditioner will also help prevent mould growth (a common allergy) by controlling the humidity levels in your home. While air conditioning isn’t specifically designed to help fight allergies, the dry, filtered air produced by an air conditioner can help allergies a lot. Is Air Conditioning Bad For Allergies? It really depends on how well-maintained your air conditioner is. If your air conditioner is poorly maintained, it may set off your allergies. But generally, it isn’t the direct cause. Older people, children, and people with existing respiratory issues are typically more vulnerable to airborne allergies. If you have any of these symptoms, it may be time to clean your air conditioner or better yet, schedule your air conditioner for maintenance. With a few simple fixes, your air conditioner can actually help alleviate your allergies. To make sure your air conditioner is helping your home fight poor air quality, and not exacerbating the problem, here are some tips. The best air conditioner for allergies is a clean air conditioner. Your air conditioner’s filters work hard to keep out dust, pollen, spores and other airborne allergens, but over time without cleaning, they can become less effective. Switching out your dirty air filter for a clean one is the best way to ensure your indoor air is as allergen-free as possible. Why is this important? A dirty filter will obstruct airflow, make your system work unnecessarily hard, and increase your electricity bills. 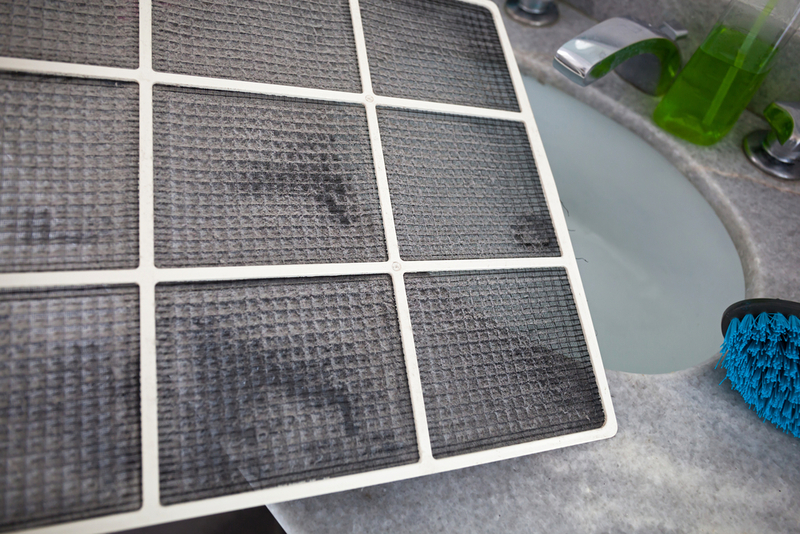 A dirty filter may also cause your air conditioner to overheat. So how often do you need to change your AC filters? Our air conditioning technicians recommend changing them at the beginning of summer (cooling season) or winter (heating season). For the very best results, change them once every three months. Ideally, humidity levels in your home should be between 30 and 50 percent. Keeping your home at this ideal humidity level will help prevent bacteria and mould from growing, decrease dust mite prevalence, and keep you and your family comfortable too. Unfortunately, leaks in your air conditioner may contribute to allergens. How? An air leaks means air will bypass your filtration system, causing unfiltered air to circulate your home. Ask your air conditioning technician to perform a check on your air conditioner for leaks to make sure the air you are breathing is well-filtered. If your air conditioning unit has a damp or wet cooling coil, humidifier, or condensate pan, mould or mildew may be growing inside your air conditioner. We recommend cleaning your air conditioner coils at least once a year and scheduling an annual service with your air conditioning technician, so they can check that each part of your air conditioner is working exactly as it should. Some of the best houseplants for allergy sufferers include chrysanthemums, peace lilies, devil’s ivy (golden pothos), bamboo palms, flamingo lilies, and pineapple plants. Final Thoughts: Is Air Conditioning Good For Allergies? Bottom line: If your air conditioning system is well-maintained, it can contribute toward healthier air quality and even may help reduce your allergy symptoms. For more healthy air conditioning advice and tips, get in touch for H&H Air Conditioning on (07) 3276 1800 (Brisbane) or (07) 5477 1777 (Sunshine Coast). Previous Post Local Success StoriesNext Post CASHBACK SPECIAL OFFERS FROM MITSUBISHI AND FUJITSU!